Each Monday at 12:30 p.m. the community emergency warning sirens are sounded, unleashing an otherworldly wail that echoes over the landscape for 15 seconds. In a real emergency, such as an industrial accident or approaching tornado, the Community Notification Network (MyCNN) contacts subscribers via landlines, cell phones, email and text messages. But the sirens have a critical role, says Cal Gardner, Sarnia’s community emergency management coordinator. The network of 15 sirens is dotted across Point Edward, Sarnia, Aamjiwnaang and Corunna. Many are in parks or near schools and are perched atop 50-foot towers. Sarnia’s are solar powered. In a real emergency, they don’t stop after 15 seconds and will sound at their full volume of 123 decibels, which is louder than sitting in the front row of a rock concert. The system is activated though a three-step computer interface at police headquarters. It could also be triggered at two undisclosed back-up locations, Gardner said. It’s the staff sergeant on duty at Sarnia Police that has the responsibility of testing the sirens on Mondays, and also determines whether a situation constitutes a public threat or not. The tests are done weekly to keep it fresh in mind. Formerly it was done monthly but the infrequency caused panic among some residents who weren’t certain what was happening, Gardner said. Actually, the sirens don’t wail every Monday. They are skipped on some holidays and when community events are held that draw large numbers of out-of-town visitors. Because it’s an alarm, it is alarming to anyone not accustomed to it, he said. Each siren has a range of about 1.5 kilometres. The first were installed in the 1980s and many were updated in 2002. They have a lifespan of 20 to 25 years. 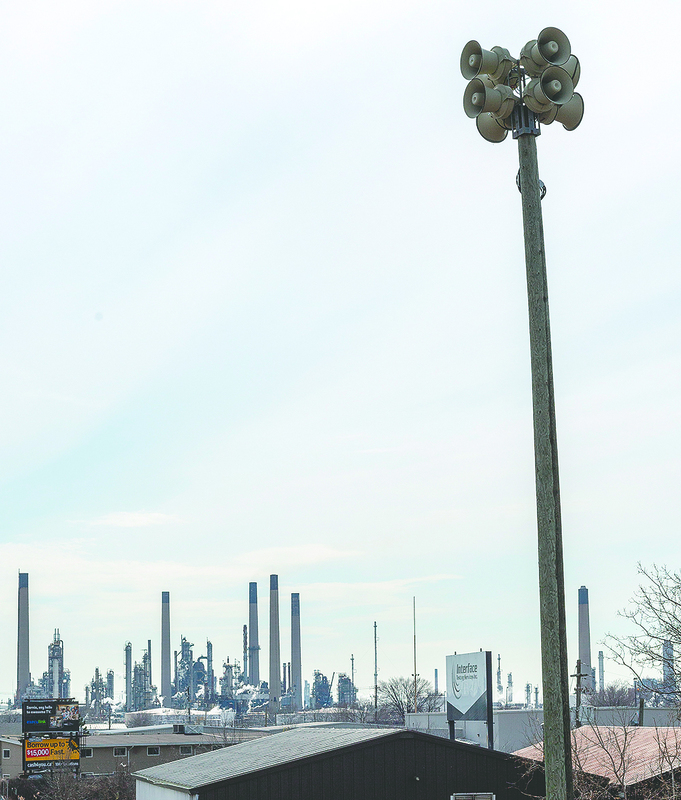 Some local industrial sites have their own sirens, Gardner said, but it’s not mandatory. When a company activates internal sirens it is required to alert police and local media. So what should you do when the emergency sirens sound for real? “People should turn to their local radio stations. If you hear sirens, you want to go indoors and turn the radio on. That’s the first step,” Gardner said. A shelter-in-place is advised in the event of a hazardous material release to the atmosphere. You should head indoors, close all windows and exterior doors, and turn off heating and cooling equipment. It’s recommended to keep a battery-powered radio in your home. Sarnians can also call 211 for up-to-date information. MyCNN has access to White Pages phone numbers, but to receive text message alerts via cell phone or email, register at www.CAER.ca.